Pick up any book on ancient Egyptian culture and take a close look at the statues of the pharaohs: you will see that they are all clasping cylinder-like objects in their hands. The most common position depicted is the Master Position. The person is standing, the left foot is slightly forward, they are looking straight ahead, a cylinder is clenched tightly in each hand and the arms held straight by their side. This position is represented in statues of the pharaohs that cover the full range of Egyptian history, varying from the Triad of Menkaura to the Colossus of Ramesses II though to the Nefertari’s Temple of Hathor and the Temple of Re-Harakhte (The Sun Temple of Ramesses II). All depict figures in exactly the same position. So the question is, what are they holding in their hands. In 1999 the Russian Dr. Valery Uvarov was the author of a book titled “The Wands of Horus”. This was the first time a theory regarding the use and construction of the cylinder was published. This is an interview with Dr. Uvarov about his discovery. Q. What is your full title and reasonability’s? A. I am the head of the Department of UFO research, Paleosciences and Paleotechnology of National Security Academy of Russia. Q. When and how was the discovery of the Wands made? A. We started investigation of wands (materials concerning this instrument) in 1992. In 1994 a photocopy of part of Count Walewski’s hand-written book, which was published in facsimile in New York Indian Hills, Colorado in 1955, came to light. In this manuscript the process of making cylindrical-shaped rods, used in ancient Egypt, was detailed. Some articles then started to appear in Russian publications about the cylinders. At that moment a decision was made to prepare materials for publication giving more details about the cylinders from scientific point of view and analyzing historical materials to ensure that there was no misunderstanding as to what the cylinders were, and how they impacted the human body. This lead to me publishing a small brochure in 1996 titled possess the necessary medical knowledge and also psychic skills. It took many years of research by an extensive team that finally lead the commencement of production of the Wands in 1999 and the publication of the book “The Wands of Horus” in 1999. Q. Have you found any sets of Wands from ancient Egypt? A. Yes, The cylindrical rods of Pepi II are in the New York Metropolitan Museum. These are conventionally dated to the 6th Dynasty 2278 - 2184 B.C. Unfortunately we were not able to touch those ones in Metropolitan museum. Just look and take some photos, that’s all. 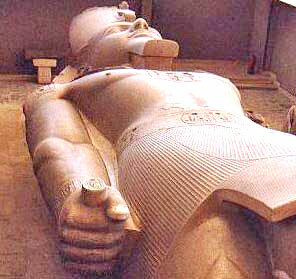 his reign is dated 6th Dynasty 2278 - 2184 B.C. Q. How and why do they work? A. The Wands have a harmonizing effect on the bodies BA and KA, or Ying & Yang, energy flows. The greater part of our illnesses begin with disharmony between two fundamental flows of energy. Hence use of something that balances these flows leads to healing of the organism. The harmonizing of the body when holding the Wands was confirmed by independent studies of the effect of the cylinders carried out in the clinical bio-physics laboratory of the Dzhanelidze First Aid Scientific Research Institute in St Petersburg in 1995. The Wands of Horus are also a means of prevention and treatment, providing the opportunity in certain disorders to correct particular deviations from the norm and noticeably improve a person’s state of health, since they inspire very deep-running physiological and energetic processes. It would not be correct to view the cylinders only as a treatment for one disease or another. 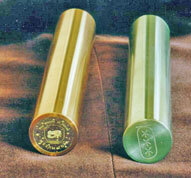 First and foremost, though, the cylinders are a tool for “attainment”, allowing you to achieve a step-by-step evolution of your energy potential and, as a consequence, of your psychic capacities, the healing benefit derived is a consequence of the body having to be in a good state of health if psychic capabilities are to function correctly. Q. I understand that the Wands have a significant impact on a persons ability to meditate, have there been any measurements on the impact of the Wands on the brains function? A. Yes, this was indirectly registered at the Polyclinic of the Medical Centre of the Administration of the Russian Federation President in Moscow. Let me explain in a different way the significance of what the electroencephalograph registered. As far back as 1953, Walter Grey, who studied brain rhythms, suggested that the brain’s sensitivity to electrical influences could provide a link between the human being and some principle suffusing everything around us! It is important to note here that the length of the electromagnetic waves with alpha-rhythm frequency is very close to the circumference of the globe and the natural resonances of the Earth-ionosphere system, in which the length of the main resonance wave is close to the circumference of the Earth. Analyzing the link between brain rhythms and the electromagnetic fields in the thin wave-carrying spherical layer between the Earth’s surface and the lower ionosphere (following Schumann, 1952) Grey Walter and Warren MacCulloch came to the conclusion that the alpha rhythm is characteristic of a process of “scanning” thought images when concentrating on some intellectual problem. In 1960 Koenig and his collaborators noted the closeness between the main resonance frequency of the globe and human alpha rhythms. Geometrically, the Wands of Horus are also attuned to the main resonance - the planet’s own frequency of vibration. For precisely this reason, even the brief influence of the Wands of Horus on the human psycho-physical field and energy structure stimulates concentration on self-made internal images, intensifying the trance or meditative effect. Whereas psychics often need months of unremitting training to attain the necessary levels, when the Wands of Horus are used, training times are substantially reduced, while the effect obtained significantly exceeds those that can be attained by ordinary means. Irina and Mikhail Kosh in Moscow have noted that a result of using the Wands of Horus a synchronization of the two hemispheres is achieved, that is an evening-out of the potentials of the cortices of the left and right hemispheres. There is an effect of deeper and gentler immersion into the meditative state that corresponds to the theta rhythms. A similar result can be attained by other methods, for example with the aid of binaural waves using sound fed through earphones. The Wands of Horus, however, have a gentler effect on a person’s energy field and, moreover, have a prolonged effect. The person’s energy field remembers, as it were, the rhythms that arose while the Wands were working and continues maintaining them for a period between 24 hours and several days. and cylinders in his hands. Q. What measured effects on the bodies physical condition have been made. A. The measured effects are many. A number of targeting experiments carried out by K.G. Korotkov, a researcher at the Centre for Energo-Information Technology at the St Petersburg State Institute of Precise Mechanics and Optics, using the Kirlian diagnostic method indicated that clearer information on the indications of illness was obtained from people holding the cylinders. In other words, in some instances the cylinders significantly increase the accuracy of diagnosis. Another series of targeting experiments carried out by Dr Blank at the Oncological Institute in Pesochny established that the influence of the cylinders puts the organism in a condition where it is much easier for it to deal with its diseases and problems itself. Dr Blank believes that the cylinders can be recommended as a prophylactic measure against jet- lag for those who frequently travel from one time-zone to another (pilots, sportsmen, tourists, long-distance lorry-drivers, and so on) for whom the clash between external and internal rhythms causes sluggishness and headaches. “… In the first few minutes a pulse wave from the left side to the right can be observed in subjects holding the cylinders. A sensation of the vessels filling with blood is registered that researchers have termed ’the vascular stage’. Infrared radiation increases from the right upper limb, and then the thermal field at the limbs evens out. Together with these changes in the subject’s organism, a general rise in activity is observed, accompanied by an 810 beats per minute increase in pulse-rate. By the second minute a warming of the cervico-thoracic section of the spinal column with increased infrared radiation was also observed. Q. Are their any situation where the Wands should not be used? This last is due to the fact that in the later stages of pregnancy there is another living organism in the mother’s womb that already at that stage of development has its own individuality (individual vibration). The wands attune themselves to a person, to his or her individual frequency. As the individual vibration dictated by the mother’s hypothalamus-hypophysis system differs from that of the developing child, the use of the wands in the last six months of pregnancy may have unpredictable consequences. Q. How seriously is this research taken by the Russian Government?. I understand for example that there are numerous sets of Wands being used in Russian hospitals. A. Very seriously. One of the main reasons why the wands were constructed by ancients is that they are the instruments for prophylaxis (preventionism) of cancer. There has been extensive research conducted in Russian hospitals on the use of the wands, there have been very good results healing cardiovascular system and in the treatment of cancer patients. It has been found, for example, that use of the Wands of Horus during some cancer treatments, such as chemotherapy, can offset the debilitating effects of these treatments and allows the patient to recover faster following the treatments. There is a good reason for this, treatments such as chemotherapy have a significant negative impact on the bodies energy balance, whereas the Wands of Horus work to restore the bodies energy balance, which not only leads to a faster feeling of well being, but also more rapid healing. 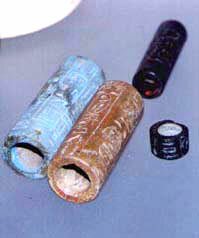 A modern day set of Wands of the cylinders and the Horus as manufactured in user. To work Russia by Valery Uvarov. Q. How are they made? A. The Wands of Horus take the form of two hollow cylinders made of copper and zinc for right and left hands respectively. This is important because the link between metal and hand is tightly bound up with the functions of the left and right hemispheres of the brain. All external and internal dimensions of the Wands of Horus conform strictly to the proportions of the Golden Section. This is of fundamental importance for the existence of resonant interaction between effectively the Wands of Horus need to attune themselves to the organism, while the user’s organism for its part should also attune itself to the Wands of Horus. Such interaction is only possible when the cylinders conform to the proportions of the Golden Section. The copper and zinc used to produce the cylinders are of high quality. The zinc has a purity of no less than 99.96% with a minimal lead content. The length of the cylinders is 151mm and the diameter 28mm. Any length can be chosen for the cylinder, although its should be noted that in ancient times the height of the cylinder, like the height of the Pyramid of Cheops, were not chosen at random. For example, the height of that pyramid (146 meters) is roughly equal to one-thousand-millionth of the distance from the Earth to the Sun. It was also connected with the period of the basic Sothis Cycle, 1460 years, which was divided up into smaller units of 1460 days - the Egyptian year cycle. Therefore the height of Wands of Horus attuned to the pyramid and to this cycle may be 146 millimeters. But, bearing in mind that the Pyramid of Cheops has been damaged, the wands should be attuned to the whole complex. It that event, the height of the Wands of Horus will ideally be equal to 151.4 millimeters. The diameter of the Wands is designed to be tuned to the Earth eigen-frequency. 5.4 or 54 is a key moment and has direct connection to Earth eigen-frequency (self frequency) which dictates the energy impulse to life on the Earth. The diameter is determined by dividing 151.4 : 5.407 = 28 millimeters. To increase the effectiveness of the Wands of Horus all the components from which the cylinders are made are exposed in a pyramid with a powerful structuring field, to correct the inter-atomic distances, for a period of at least twelve days (and nights). Q. Is there something you would like to say in conclusion? A. The aim of the researches carried out by my team has always been to discover and pass on to people that which might be of invaluable assistance to humanity in the further development of a positive mentality in our civilization. An analysis of the Ancients’ level of knowledge and of the religious teachings that formed in the process of historical development leads to the unequivocal conclusion that at the foundation of the ancient way of looking at the world there was one substantial defect that determined the fate of not only Atlantis and Hyperborea, but also the Egyptian, Mayan, Toltec, Aztec and many other past civilizations. The evolutionary significance of the consequences of that “defect” has proved so powerful that almost fifteen millennia were needed to produce the conditions needed to correct the deformations of moral and ethical standards that arose in the consciousness of the earthly human race. The chief cause of the general decline in morality and, as a consequence, of the long period of degradation full of tragic events intended to cause mankind to recognize the need to think again is the prevailing attitude towards God. Practically not a single one of the religious teachings and philosophical doctrines existing today provides mankind with the necessary conception of the Creator. More than that - the subject is not even broached, and all attempts to discuss Him come down in effect to questions of the relationship between man and God. With all the ramifications of the question posed in that way, the attention of many generations ended up being distracted from the key issue that in fact, by forming the basis of the world view, determines the fundamental meaning of existence and the principles for interaction with the World. The human race has gone down a blind alley, the way out of which may be provided by remembering the origins and the tie between a person and the world around. The knowledge acquired in ancient times, but cosmic in origin, including information about the structure of the solar system and the fundamentals of calculating cyclical processes, also included information about the structure of the human organism and of everything that exists - the BA-KA principle. If we bear in mind that everything in our universe is constructed in accordance with that principle, then it becomes evident that the quintessence of the knowledge passed on in ancient times was the pointing out of the unity of structure between Man and the Universe. There is hope that at the current historical stage that mankind’s intelligence will prove sufficiently developed to grasp the meaning of the knowledge about God given to humans in earlier times. And while in the remote past that knowledge belonged to a narrow circle of people, the time has now come to correct that shortcoming and to make it the property of all mankind. Valery, thank-you for your time. The Triad of Menkaura, currently located in the Cairo Museum. 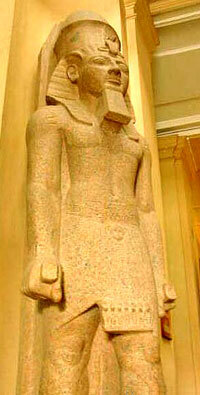 Note the stance adopted by the Pharaoh and the cylinders in his hands. Menkaura’ s reign is dated 4th Dynasty 2532 - 2503 B.C.